Mix warm water, yeast, sugar, salt & oil. Start adding flour 1 cup at a time, until it forms a ball that comes away from the sides of the bowl. The dough should be soft and tacky, but not enough to stick to your hands. If the dough is sticking to your hands, add a heaping tablespoon of flour one at a time until the dough is the right consistency. Form into a ball and place in an oiled bowl. Cover and set in a warm place until doubled. Place dough on an oiled pizza pan and roll or press out to size. Top with approximately 1 1/2 cups of sauce, 1 1/2 cups shredded cheese. Then add other desired toppings to taste. Cook at 425 until the cheese is brown and bubbly and the bottom of the crust has browned. Do you have pizza lovers in your home? What's your favorite recipe for pizza? Like A Restful Place on Facebook or subscribe by email (left sidebar)! 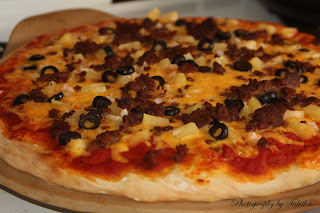 Oh yes, our family LOVES homemade pizza, too! Yours sounds and looks delicious. Thanks for sharing, and for linking up at Natural Living. I would have never thought to use coconut oil, how cool! I also love that you can just have the dough on hand. Thanks for linking up with Delicious Dish Tuesday :) If you wouldn't mind providing a link back to the hop we would appreciate it. we love pizza! But we have never used coconut oil in the crust. Will have to give that a try! I've made homemade pizza once. Not sure why I haven't done it since, cause it was so good! I dont have coconut oil, but must go get some to try this now! Ohh, Baby, Baby Giveaway Hop! Plain Jane Laundry Soap Review & Giveaway!